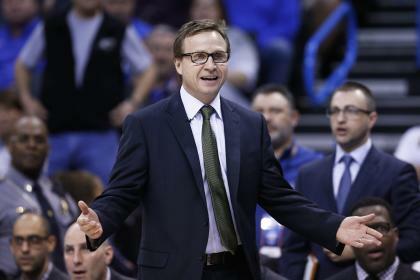 Former Oklahoma City Thunder coach Scott Brooks plans to pass on interview chances with the Denver Nuggets and New Orleans Pelicans and appears inclined to sit out the 2015-16 season, league sources told Yahoo Sports. Brooks, 49, wants to coach again but plans to take the year to look at television opportunities and reconnect with his family living in California, sources said. Brooks has a 338-207 (.620) career coaching record, including three trips to the Western Conference finals and an appearance in the 2012 NBA Finals. Brooks was voted the 2010 NBA Coach of the Year. He has a player development track record with the Thunder that’ll contribute to his value on the coaching market next year. Under Brooks, Kevin Durant, Russell Westbrook and Serge Ibaka grew into marquee talents. After missing the playoffs because of a bevy of injuries this year, Oklahoma City fired Brooks in April. The Thunder hired Florida coach Billy Donovan. Oklahoma City owes Brooks the balance of his 2015-16 salary.